My very first memory of the Blessed Mother is from the first grade. I went to a Catholic school with Bernadine Nuns. My teacher, Sr. Joseph Clare, made sure every single student in our class had an opportunity to crown Our Lady during the month of May. Every morning one of my classmates would bring in a homemade flower crown and place it on the head of the little statue of Mary we had in the corner of our classroom. One of the perks was that we got to wear our Sunday best and not our uniform that day when we crowned Our Lady. For this girly girl that was HUGE! Fancy clothes AND a crown? Sign me up. I had five brothers at the time. My sister would not arrive for another three years. I was the only girl with my own room. Mama Mary was a Queen. I was a Queen in my own mind. She loved crowns, because why else would we be doing it for an entire month. I loved crowns. Mary had flowers named for her. I just loved flowers. I remember pointing to each hot pink blossom and my Dad carefully clipping several branches from our azalea bush. He patiently wired the flowers in a circle using the measurements Sr. Joseph Clare had sent home. I remember holding that sweet little crown in my lap so carefully that my mother packed in a sandwich bag with wet paper towels. I would not allow any of my rowdy siblings to touch my precious gem. I was nervous and excited and I could not wait to get to school to crown Our Lady. I hated school. I truly did. I was dyslexic (un-diagnosed until high school). I was loud and rowdy when you were supposed to be still and quite. I hated Math. I still hate Math. But that day, I was breathless with excitement to get there. I could not wait. I got to school and I almost cried as we sang “Bring Flowers of the Fairest”. My hands shook as I placed that crown on the statue and then stood back in horror as it slipped down and became the loudest, boldest lei Our Lady had ever worn. Some of the boys laughed. Some of the girls snickered. Sr. Joseph Clare rushed over took the crown off and pinched it a bit then had me place it back on Our Lady’s head. I did and it stayed in place. But the moment was over and I felt like a failure. It didn’t matter that Our Lady looked beautiful. It didn’t matter that you couldn’t see the little adjustment Sr. Joseph Clare had made. It just didn’t matter. All I could see was the imperfection. It has followed me my whole life. Getting so excited about something, spending hours imagining the perfection of the moment and then CRASH! BAM! BOOM! It doesn’t live up to my dreams. I have no doubt Our Blessed Mother had hopes and dreams. What girl doesn’t. I imagine she was a happy little girl. She had no sin standing between her and Our Lord to cloud her heart and complicate that relationship. Did she experience disappointment? I am sure she did but she probably didn’t go running to her room, throw herself on the bed and declare to her Mother, St. Ann, that she was never going back to school due to the humiliation she survived that day because of a crimped flower crown. Not that I did that…oh wait. I share this story because life is not about meeting our expectations but about meeting God’s expectations. 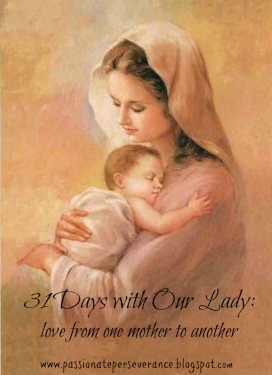 Our Blessed Mother is always on our side cheering us on in this endeavor. I have no doubt neither Jesus nor His Mother were disappointed in my efforts that day more than forty years ago. Pride stood in my way that day. I wanted to impress my teacher and my classmates. I wanted to have “the best” crown for Mary out of anyone else. I wanted to be better than they were. Oh pride…you slippery little stinker. Humiliation is your sure companion. Mother Mary did not need me to be better than others that day or this day. She just needs my best and in the doing, her Son is glorified and in that she is pleased and honored. I still tear up when “Flowers of the Fairest” is played at church. In an instant I am a six-year-old little girl in my best Sunday dress and patent leather shoes, happily holding an azeala flower crown waiting for the big moment. Time has eased that pain of humiliation, making the memory bittersweet. I now concentrate on the good parts, my fathers generous help, my mothers gentle smile and reassuring hug and the honor that crowning Our Lady really was. Time has a way of teaching us what really matters. Thank you for loving us right where we are, in our moments of pride and humiliation as well as in our successes. We ask that you gently guide us to think of what is really important, of what it is that we need to learn to grow closer to your Son. Help us to see how He loves us through everything. Help us to lay down our expectations and want what God wants. He only asks us to do our best and trust in His plan. Sometimes we want to do more to be seen and be lauded above others. Help us to understand the true meaning of humility and love of others as you taught us with your fiat. Help us to say “yes” today and everyday, trusting in The Father’s plan. "She just needs my best and in the doing, her Son is glorified and in that she is pleased and honored." Yes to this! Yes indeed my friend. It's so easy and yet so challenging sometimes to just do our best. What a touching story; thank you for writing this! !